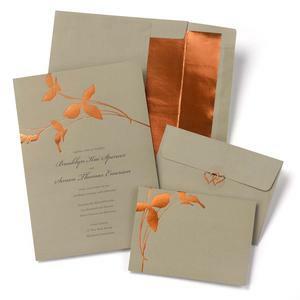 2140010 - Kraft paper invitations with copper floral design. 5 1/2" x 7 3/4". R.S.V.P. folders, 4 3/4" x 3 1/2" folded. R.S.V.P. envelopes and invitation envelopes with copper liners. Clear seals with copper hearts. Ready for you to print. Package of 50.